I visited Herat, Afghanistan for the first time in 2010 and saw many aspects of life on the cusp of change, especially amongst the youth – billiard clubs had become popular, women were learning English and the younger generation was becoming adept in computer science. After coming back to Iran, I did some research and found a plethora of photographs of a very modern lifestyle in Afghanistan from the 1970s. Interestingly, these photographs look incredibly similar to the kind of photographs that were being generated from my home town, Tehran, at the same period of time. I decided to go back to Afghanistan, this time to Kabul. I came to realise that the youth love their country and want to help rebuild it, but also want to enjoy being young – having access to the internet, to malls and restaurants, coffee houses, and to experience music and art. 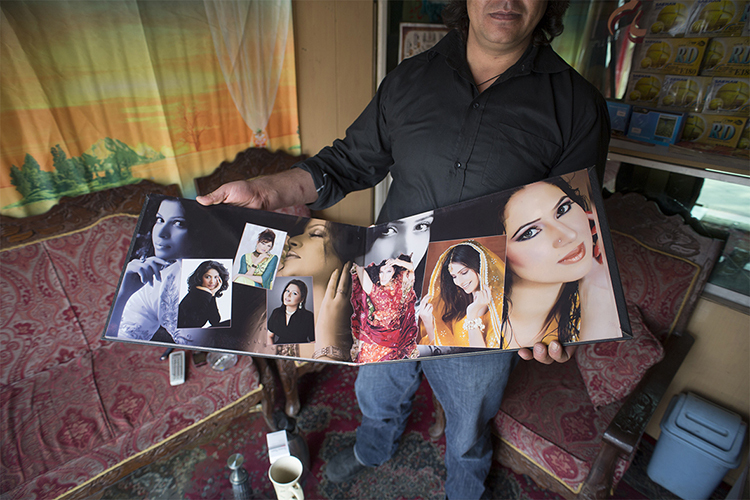 An Afghan wedding photographer shows bridal portraits at his photo studio in Kabul, March 6, 2014. Despite decades of conflict in Afghanistan, and several recent militant attacks, the country’s capital Kabul is home to a vibrant youth scene of musicians, artists, athletes and activists. Shopping malls and cafes stand in the city, which is nonetheless beset by infrastructure problems and instability. Afghanistan is preparing for an election on April 5 that should mark the first democratic transfer of power in the country’s history, but it has been hit by a tide of violence as the Islamist Taliban movement has ordered its fighters to disrupt the vote and threatened to kill anyone who participates. 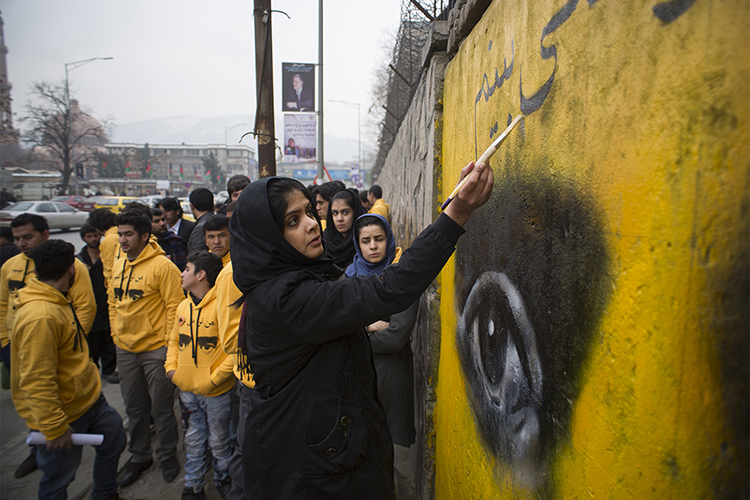 An Afghan social activist and member of Peace Street NGO paints a grafitti on a wall of the education ministry building in Kabul, March 8, 2014. Despite decades of conflict in Afghanistan, and several recent militant attacks, the country’s capital Kabul is home to a vibrant youth scene of musicians, artists, athletes and activists. Shopping malls and cafes stand in the city, which is nonetheless beset by infrastructure problems and instability. Afghanistan is preparing for an election on April 5 that should mark the first democratic transfer of power in the country’s history, but it has been hit by a tide of violence as the Islamist Taliban movement has ordered its fighters to disrupt the vote and threatened to kill anyone who participates. 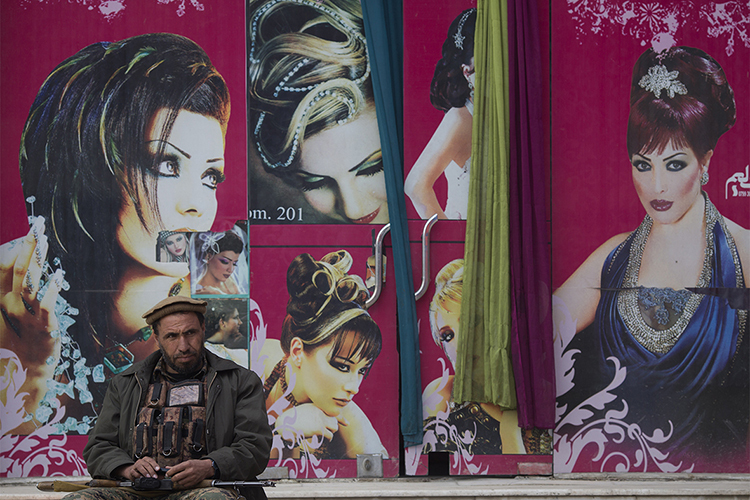 An Afghan security looks on as he sit in front of a barber shop just out of the Kabul-Dubai wedding hall during a ceremony to mark the International Woman’s day, in Kabul, March 8, 2014. Despite decades of conflict in Afghanistan, and several recent militant attacks, the country’s capital Kabul is home to a vibrant youth scene of musicians, artists, athletes and activists. Shopping malls and cafes stand in the city, which is nonetheless beset by infrastructure problems and instability. Afghanistan is preparing for an election on April 5 that should mark the first democratic transfer of power in the country’s history, but it has been hit by a tide of violence as the Islamist Taliban movement has ordered its fighters to disrupt the vote and threatened to kill anyone who participates. 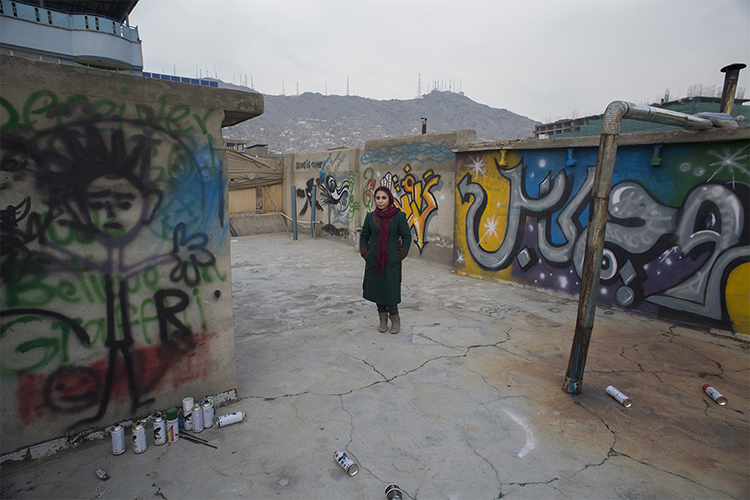 Afghan female artist, Shamsia Hassani, poses for a photograph on a roof of her grafitti workshop in Kabul, March 2, 2014. Despite decades of conflict in Afghanistan, and several recent militant attacks, the country’s capital Kabul is home to a vibrant youth scene of musicians, artists, athletes and activists. Shopping malls and cafes stand in the city, which is nonetheless beset by infrastructure problems and instability. Afghanistan is preparing for an election on April 5 that should mark the first democratic transfer of power in the country’s history, but it has been hit by a tide of violence as the Islamist Taliban movement has ordered its fighters to disrupt the vote and threatened to kill anyone who participates. 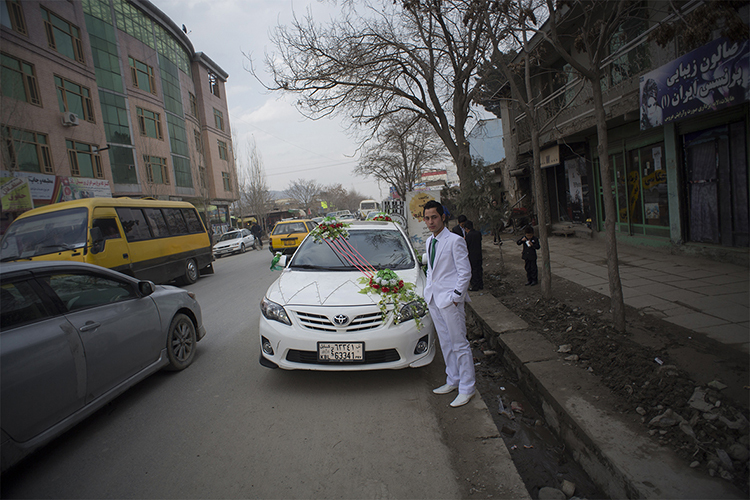 An Afghan groom stands next to his decorated car as he pose for a photograph just after leaving a barber shop in Kabul, March 6, 2014. Despite decades of conflict in Afghanistan, and several recent militant attacks, the country’s capital Kabul is home to a vibrant youth scene of musicians, artists, athletes and activists. Shopping malls and cafes stand in the city, which is nonetheless beset by infrastructure problems and instability. Afghanistan is preparing for an election on April 5 that should mark the first democratic transfer of power in the country’s history, but it has been hit by a tide of violence as the Islamist Taliban movement has ordered its fighters to disrupt the vote and threatened to kill anyone who participates. 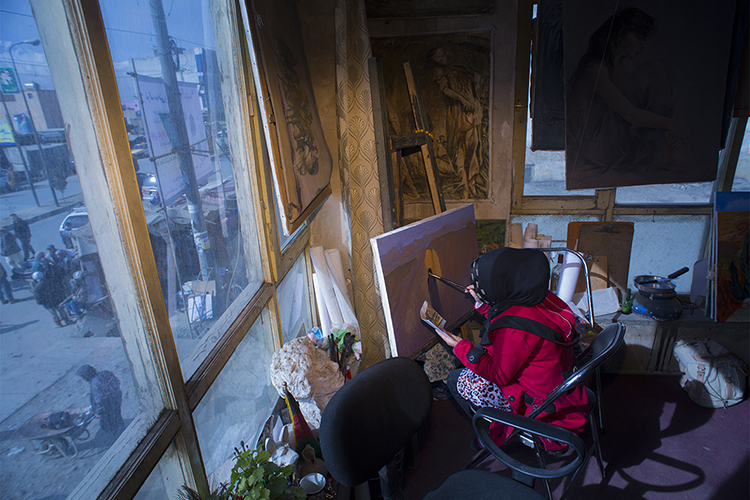 An Afghan woman paints as she take part a private art institute in Kabul, March 2, 2014. Despite decades of conflict in Afghanistan, and several recent militant attacks, the country’s capital Kabul is home to a vibrant youth scene of musicians, artists, athletes and activists. Shopping malls and cafes stand in the city, which is nonetheless beset by infrastructure problems and instability. Afghanistan is preparing for an election on April 5 that should mark the first democratic transfer of power in the country’s history, but it has been hit by a tide of violence as the Islamist Taliban movement has ordered its fighters to disrupt the vote and threatened to kill anyone who participates. 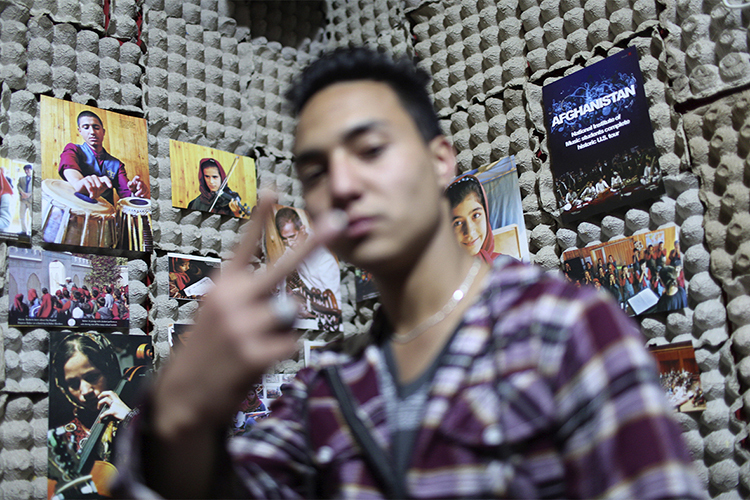 Afghan rapper Mahmoud Hejran shows his band’s symbol as he poses for a photograph at his apartment, which is used as a music studio, in Kabul March 3, 2014. Despite decades of conflict in Afghanistan, and several recent militant attacks, the country’s capital Kabul is home to a vibrant youth scene of musicians, artists, athletes and activists. Shopping malls and cafes stand in the city, which is nonetheless beset by infrastructure problems and instability. Afghanistan is preparing for an election on April 5 that should mark the first democratic transfer of power in the country’s history, but it has been hit by a tide of violence as the Islamist Taliban movement has ordered its fighters to disrupt the vote and threatened to kill anyone who participates. An Afghan female powerlifter performs during a local sport ceremony in a stadium in Kabul, March 8, 2014. Despite decades of conflict in Afghanistan, and several recent militant attacks, the country’s capital Kabul is home to a vibrant youth scene of musicians, artists, athletes and activists. Shopping malls and cafes stand in the city, which is nonetheless beset by infrastructure problems and instability. Afghanistan is preparing for an election on April 5 that should mark the first democratic transfer of power in the country’s history, but it has been hit by a tide of violence as the Islamist Taliban movement has ordered its fighters to disrupt the vote and threatened to kill anyone who participates.